I give Teen Wolf Season 4, Three Full moons out of five. It doesn’t have as much content as season 3 did but it dose give you 12 new episodes to sick your teeth into! MTV will kick off season five of their hit series Teen Wolf with a two part series kick off, part one airing on June 29th and part two on June 30th. So it's best that you run out to your local DVD seller and buy Teen Wolf Season 4 (just being released this week) and get caught up before the new season starts! For all those who are fans of the MTV series, and you know who you are, you already know the story. But for all those who have never seen the series let me shed a little light on Teen Wolf. Yes it is loosely based off the 1985 Michael J. Fox film. For those adults who were around in the 80's, I would venture to say most of you have seen it and know exactly of which I speak. And for you teens, which are watching the series, if you want to amuse your elders, watch it and you can tease them about how corny all their 80's movies are!! Flash forward 26 years and MTV airs its first episode of Teen Wolf revolving around a social outcast Scott McCall (played by Tyler Posey) who was bitten by a werewolf and now needs to learn how to deal with not only the day to day strife of teenage life, but the pains of turning all wolf which makes romantic walks in the moonlight quite difficult! 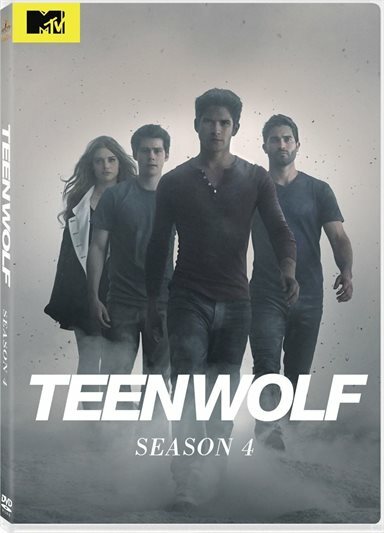 Of course season four brings Scott and all his classmates back for a new semester of chaos along with them trying to help their new friend Malia adjust to society, but Kate Argent's resurrection brings a whole now situation to Beacon Hills. The big question is who is "The Benefactor" and what part will he play? When it comes to TV series, you best start at the beginning. If you are curious about the series don't just dive in right in the middle but start off in season one and work your way up to this one. For all the fans of the series, season for is of course a must have! While season three had 24 episodes, season four only has 12 episodes but also included in the box set is the Extras "The Visual Effects Behind "The Dark Moon", Shirtless Montage Strikes Again, The Beasts of Beacon Hill and not one, but TWO gag reels. Now interestingly enough, Teen Wolf was renewed for a full 20 Episodes in 2015, which of course will be split in two halves, which of course start next week. But more interestingly enough is the decision to bring up Dylan Sprayberry's Character Liam Dunbar from a recurring role to a full time main character. Of course you know what that means. Someone has to take a back seat and in season five that will be Derek Hale! It seems as if Tyler Hoechlin wants to spend more time on movie projects to which he has 4 movies already in post-production as we speak so It looks as if we will be seeing him more on the big screen and only as a recurring, more supporting role on Teen Wolf in season 5. Well as far as DVD sets go, if you're a fan of the series I say go out and get this one to add to your set! If you haven't seen an episode of the series….start at one and work your way up to season 4! And if you don't have that much time just pop in the Michael J. Fox one and remind yourself just how cheesy those 1980's flicks truly were! I give Teen Wolf Season 4, Three Full moons out of five. It doesn't have as much content as season 3 did but it dose give you 12 new episodes to sick your teeth into! Download Teen Wolf: Season Four from the iTunes Store in Digial HD.